In small bowl, mix 1/2 cup of the salsa, the marmalade and 4 tablespoons of the lime juice; season with salt and pepper. Pour into large resealable food-storage plastic bag. Add chicken; seal bag. Turn bag several times to coat chicken. Refrigerate 30 minutes. Heat oven to 375°F. In another large resealable food-storage plastic bag, mix bread crumbs, cheese and chopped cilantro. Remove 1 chicken breast at a time from marinade; shake off excess marinade. Place in bag of bread crumbs; seal bag and shake to coat with crumb mixture. Place chicken on nonstick cookie sheet. Discard any remaining marinade and crumb mixture. Bake uncovered 20 to 25 minutes, turning once, until juice of chicken is clear when center of thickest part is cut (170°F). Meanwhile, in 2-quart saucepan, place corn and edamame; add enough water to just cover vegetables. Heat to boiling over medium-high heat. Reduce heat to medium-low; cook uncovered 5 to 6 minutes or just until edamame is tender. Drain; stir in remaining 3/4 cup salsa, the cumin and remaining tablespoon lime juice. Season to taste with salt and pepper. Cook over medium-low heat 1 to 3 minutes, stirring occasionally, until thoroughly heated. 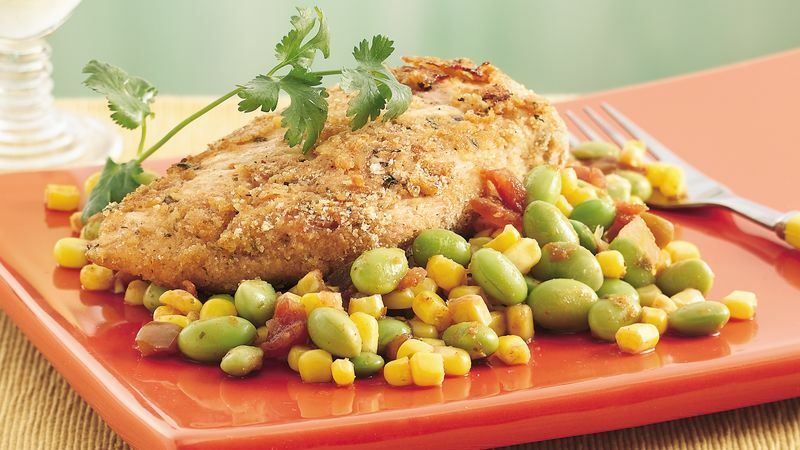 Serve chicken with succotash; garnish with cilantro sprigs.